I was just listening to a news show on TV about the Japan quake/tsunami/nuclear plant events. And something has just dawned on me that hadn’t before. They were doing a story on the Chernobyl nuclear accident. And I had never really paid that much attention to the details of that until now. It happened on 26 April 1986. We were married in the middle of May 1986. Two days after we were married, we flew from Boston to London, England, and rented a car and drove all over England and Scotland for 3 glorious weeks for our honeymoon. That was only 2 weeks after the nuclear accident. So we came home 3 weeks later and resumed our daily lives. In the meantime, between 1986 and now, we made 7 more trips back to the UK for 2-week visits, our last visit there being in 2002. About 5 or 6 years ago, Paul came down with thyroid cancer. He had to have his entire thyroid lobes removed and needs to take thyroid replacement medication now for life. I am wondering if the air in the UK at that point in time could have contributed to his getting thyroid cancer all those years later? 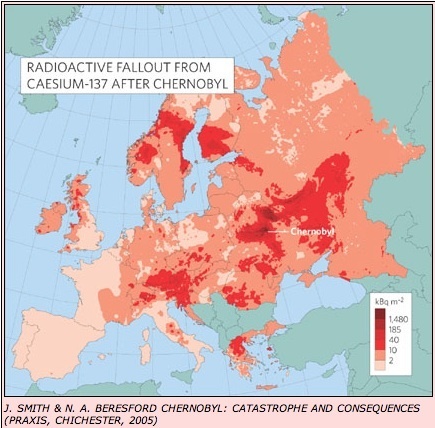 If you look at the map below, you can see where there was some spread of the radiation into Scotland, and we were up in that same region then. He is such an otherwise healthy guy, I never could figure out why he got it. He has NO bad habits at all. He’s the healthiest person I’ve ever known – all except for this one thing – thyroid cancer. It’s food for thought. Not that we can do anything about it, but still…. I tip my hat (if I wore one) to the Japanese citizens who, in my opinion, should be the winners of the TIME PERSONS OF THE YEAR award – just for their amazing fortitude, patience, honesty, and politeness. I’ve learned so much about those people this past week, and I have enormous respect and admiration for them. Now if only some of those supplies sitting out on the ships would make their way into the villages and relieve these poor people soon! 4 Responses to Cause and Effect? My granddaughter, Sarah, was born in 1986 (May), and has just been diagnosed with thyroid cancer, and the surgery is coming up. She was born here, but I wonder how far things like that do spread, on the winds. Her doctors are up-beat and don’t think it will be a problem (?) It does make one wonder. Sarah has a four year old boy and a 7-month old baby girl. I think it’s quite possible. My grandmother had thyroid cancer, and I can’t really place where she might have gotten exposure. But my mother died of leukemia when she was only 35, and we know that she had exposure from atomic testing in the 50s. If it helps any, my grandmother who had thyroid cancer lived to the ripe old age of 89. It’s a shocking thought isn’t it, and I don’t think it is at all out of the realm of possibility. He may have had just enough exposure to trigger the cancer, maybe through something he ate that you didn’t. I agree with you about the fine and courageous way the Japanese people have responded to the emergency. Some of the people at work were remarking that if some area in the U.S. were devastated like that, scavengers and looters from all over the country would be flocking to the area. Here in Los Angeles we’ve seen our share of that kind of reaction to civil unrest and natural disasters. WOW…That very well could be the reason …Paul is always good about eatting right. Thanks for shareing this…give a person something to think on .